For Indoor Or Outdoor Use. 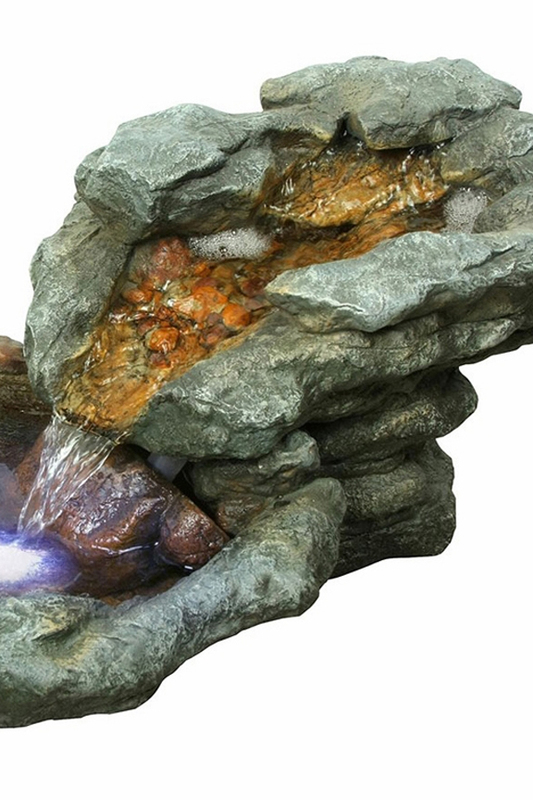 A Fiberglass Fountain With LED LIghts. Stuff Points: Earn 111 points when you buy this stuff. 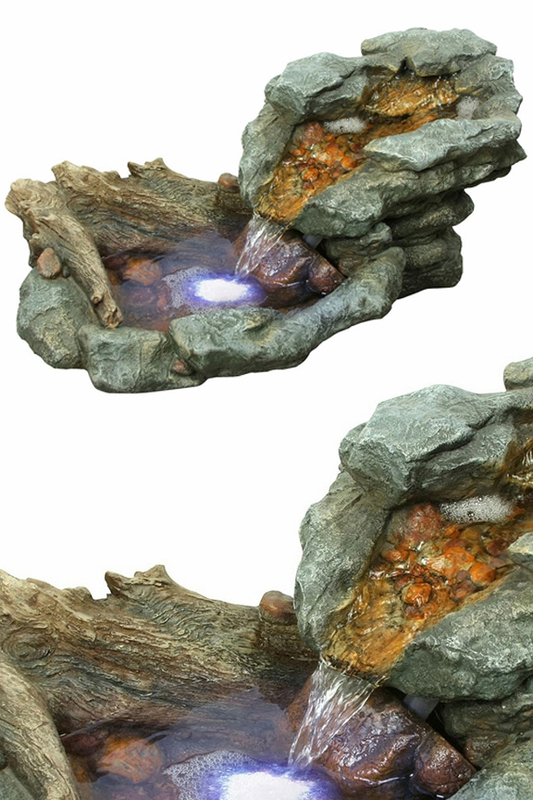 A natural stream winding through a mysterious forest, or the awesome fountain sitting on your table. It's difficult to tell the difference. Realistic looking river rocks combine with fallen tree parts to create an incredible scene that looks like it was plucked straight from nature. Although it appears to be the real thing, every part of this fountain is actually constructed from a fiberglass resin and then hand finished to make it look authentic. The included pump will bring water up to the pool at the top in order to fill it completely. Once full, it will cascade out to gently fall down the waterfall created by the strategically placed stones. After dropping down, it will fill the lower pool, and the collected water will sparkle as it's illuminated by the underwater light. The whole thing is completely contained, so the same water will continue to circulate over and over again. It can be placed inside or out, and the soothing sounds will help block unwanted noise, and relax away tensions. With compatibility that allows you to plug it in anywhere, and a simple set up process, this mode is perfect for almost anyone, and it can be up and running with very little effort. Bring the outdoors in, and let the aged bark and weathered stone set the mood with this amazing water feature. Includes All Parts. A high quality pump and every other part necessary will be included with your purchase. Set up will be quick, simple and frustration-free. Easy Set Up. It plugs into any standard outlet, and there is little to no assembly required. Just connect the electricity and fill it with water to be up and running in a matter of minutes. Natural Waterfall. The wide, gentle path looks just like nature intended, and the sound created reflects that. A steady stream will cascade down the small waterfall formed from the realistic river rock. High Quality. Made from a fiberglass resin, this model has a high end look without the weight or cost. It looks like real rocks and wood, but it's actually a much lighter, and less messy material. Skillfully Crafted. With a balanced mold, and durable construction, it will work well, and last for years. Finishing touches give it a one of a kind look, and enhance the natural appearance. Indoors or Out. The versatile materials are safe for exposure outdoors. Use inside on a table in your living room, or use to improve an outdoor patio. Like a natural creek deep in the woods, this model combines realistic looking stone and wood to create an impressive water feature for indoor or outdoor use. Order Yours Today! Indoor Water Feature with Lighted Rolling Ball and Natural Stone. 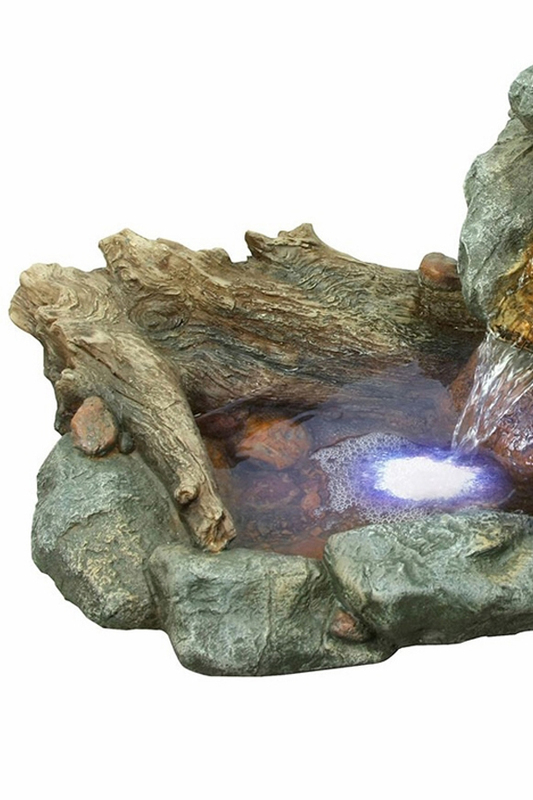 Natural Stone Water Feature with Lighted Rolling Ball. A Realistic Looking Water Feature With Underwater Lights. Durable Fiberglass Looks Like Real Wood! Simple and Natural. Bring Peaceful Serenity To Any Location. A Double Waterfall Inside A Realistic Log. Water Cascades Down Lifelike Leaves. A Natural Looking Tree Trunk Is Home To Three Leaves That Direct Water Flow. Water Pours From One Copper Leaf To The Next. Use Indoors Or Out. Three Colorful Ceramic Pots Cycle Water From One To The Next. Use Indoors Or Out.